I am a huge fan of resistance bands for workouts and rehab because of my athletic training background! 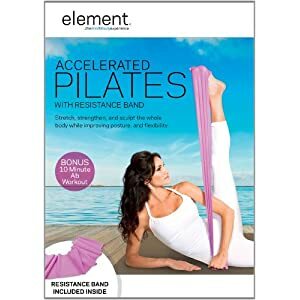 It is an inexpensive, but very effective workout accessory and when paired with Pilates, like in Element: Accelerated Pilates with Resistance Band, makes for a very effective workout! Filmed in a lush garden overlooking the Pacific Ocean, these programs use the resistance band to increase intensity and emulate movements performed on the Pilates apparatus used in private studio sessions. The 30-minute total body routine can sculpt even the deepest muscles in a short amount of time by emphasizing the quality of repetitions, not the quantity. This fluid routine incorporates all muscle groups to produce a slimmer, stronger, and more toned body. The bonus 10-minute ab session provides extra focused work to help achieve a firm, flat midsection. These two programs are specifically designed to deliver accelerated results. Together they will stretch, strengthen and sculpt the whole body while improving balance, posture and flexibility. Lisa Hubbard is a certified Pilates instructor with over a decade of experience. She is a faculty member for the world-renowned BASI Pilates, the founder of Rhythm Pilates, and teaches from her private studio in California in addition to traveling the globe to certify new teachers. An active member of the Pilates community, Lisa has been featured in textbooks, educational literature and leading periodicals like Pilates Style Magazine. With a diverse clientele, Lisa enjoys teaching students of all levels from professional athletes to those trying Pilates for the very first time.